The fifth annual Rose’s Angels was a success by every measure. This year, project co-founders Courtney Cohen and Lynne Fader facilitated multiple donors of goods in-kind and financial, led six months of collecting items and gathered more than 70 volunteers to pack more than 1,100 care bundles, plus additional bulk packages for Richmond-based outreach agencies. Seventeen Richmond agencies – as well as Jewish Family Services’ Jewish Food Bank and Salvation Army’s Deborah’s Gate, both Vancouver-based programs – received these bundles. 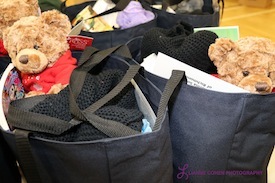 Each bag contained warm clothing items, hygiene products and food, among other things, to make a recipient’s day a little easier, and each was created to be specifically for men, women or children. The bags included a special note from the Rose’s Angels family, expressing hope that the items bring some enjoyment and a smile. Agency recipients also included Touchstone Family Association, Chimo Community Services, Richmond High’s Colt Young Parent Program, Tikva Housing Society’s Storeys residence, Heart of Richmond AIDS Society, Richmond Mental Health, SUCCESS, Richmond Food Bank, Turning Point Recovery Society, Richmond Family Place, Pathways Clubhouse, Chabad Richmond’s Light of Shabbat Meals program and Gilmore Park Community Meal. For those wishing to make a donation to Rose’s Angels or to get involved with the Kehila Society, contact the society office at 604-241-9270.